Because Nathan and I have spent the last nine years living states away from both our families, we never travel for the holiday. Instead, we embrace Friendsgiving (which seems to have caught on as an actual word) and, if possible, host the feast ourselves. Nathan had to work on Thursday, so we decided to push our celebration back to Saturday. When the day came, we spent the morning cooking, cleaning, and finally finishing the last season of Breaking Bad before our guests started to arrive. This year we had our biggest crowd yet, and it was because we hosted on Saturday - even friends who spent the official holiday with their families on Thursday joined us for round two. 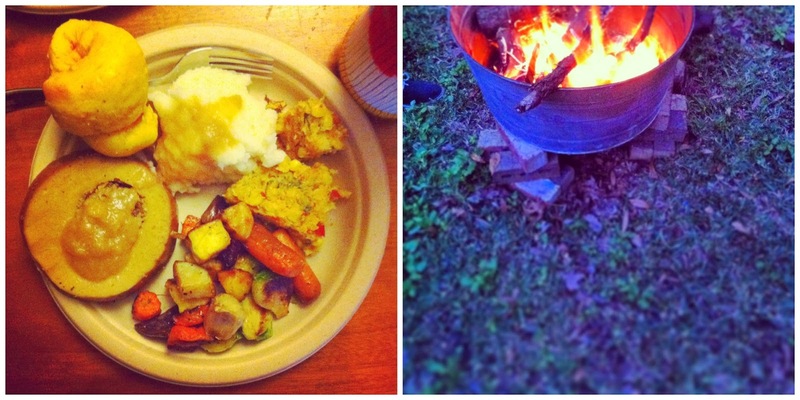 We kicked things off with feast of epic proportions, as is the Thanksgiving way. I cooked the bulk of the food, providing Tofurky (a holiday classic), mashed potatoes, southwestern corn pudding casserole, pumpkin garlic knots, and chocolate pudding pie (all of which was vegan, half of which was also gluten free). Other people contributed an assortment of roasted root veggies, chips and the world's best guacamole, cranberries galore, apple pie, a lemon olive oil cake, cranberry cocktails, bourbon, more bourbon, and cider. It was a good spread, and we had to pull our picnic table into the kitchen to fit everyone. Had to take a photo from both sides to get everyone in. I am attempting to take more photos of actual humans. Despite my Scattergories losing streak, I was grateful to celebrate Friendsgiving with this particular group of people. Most of us are graduating in May, which means next year's gathering will be much smaller. But I don't want to think about that now. Instead, I'm going to focus on all the things for which I'm thankful - friends, feasts, and the good fortune to gather together, around tables and fires. If you celebrate any kind of -giving, I hope it was lovely and that you're also having leftover pie for breakfast. It's the Thanksgiving way.